Martin suffered through an injury-plagued college career, rushing for 1045 yards in ten games as a junior and then, after a 251-yard performance against Texas in the first game of his senior year, he went down with a severe ankle sprain. He chose to enter the 1995 NFL draft and was taken by the Patriots in the third round. While there were concerns regarding his injury history, Martin quickly allayed them by rushing for 102 yards in his NFL debut. 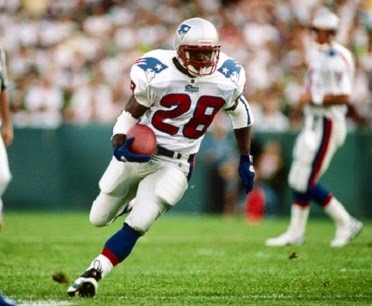 Martin followed up with another Pro Bowl year in 1996, rushing for 1152 yards and catching 46 passes as the Patriots won the AFC title. It was the second of ten straight seasons in which he rushed for over a thousand yards. An elusive runner who caught the ball well out of the backfield, he exhibited impressive stamina and durability, although he missed three games in ’97 due to an abdominal injury that required surgery. After rushing for 3799 yards and 32 TDs with New England, Martin was signed as a restricted free agent by the New York Jets in 1998, reuniting with Bill Parcells, his first coach with the Patriots, and played a key role in that team’s quick turnaround. Despite maintaining a heavy workload, he carried on through a string of 119 consecutive starts before a major knee injury finally ended his career 12 games into the 2005 season. Along the way, his quiet consistency was often overlooked, but he twice gained over 1500 yards in a season, including a league-leading 1697 at age 31 in 2004. Overall, he received consensus first-team All-NFL honors once, gained at least some first- or second-team recognition after three other years, and was selected to the Pro Bowl five times while rushing for 14,101 yards, which ranked fourth all-time at his retirement, on 3518 carries (4.0 avg.) and catching 484 passes for another 3329 yards, giving him 17,430 yards from scrimmage. He scored an even 100 touchdowns (90 rushing, 10 receiving). The Jets retired Martin’s #28 and he was inducted into the Pro Football Hall of Fame, Class of 2012.